Both the ambo and the altar were designed and made to be handicap accessible so that they could be elevated on a hydraulic, thus, enabling the wheelchair-bound priests to celebrate Mass. 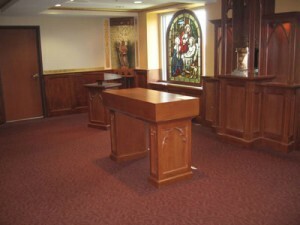 We provided all designs and built the entire Chapel. Project included all new woodwork and artistic church painting. We also resurrected and re-created old windows which were to be implemented into the design of the chapel. We provided new statuary and also refurbished an antique, classical picture of Our Lady of Perpetual Help.The challenge with Stella Maris was to try to create a warm and intimate Chapel from two hospital bedrooms and create the feel and the look of a devotional worship space. Click on the photo above to view video of entire renovation. The Perpetual Help icon is such an incredibly important image for the Redemptorist Fathers (part of their mission is to spread devotion to Our Lady under this title) and one of the four original images of Our Lady of Perpetual Help was given to St. Jude Liturgical Arts Studio to restore and re-fabricate. A Shrine with this refurbished image was created for the chapel that is truly worthy for Our Lady and for these priests who have devoted their entire lives to the Faith. This chapel was made for the closing years of the retired Redemptorist Fathers who have served the Church so valiantly during their lives. These elderly priests spend most of their remaining years in prayer ministry and so we needed to create a worship space of peace and hope-a fitting area to spend their time with the Lord. St. Jude Liturgical Arts Studio, working closely with the Redemptorist Fathers, attempted to create those items that the senior priests related to during the course of their active ministry: Gothic woodwork, carved statuary, traditional artistic painting, including faux and trompe l’oeil designs in the ceiling, gold leaf stenciling and Classical Stainglass windows, originally from their seminary which was closed, and were retrofitted into the new window space.